Blondes with Beards are a UK based four piece harmony group from Stroud, Gloucestershire. 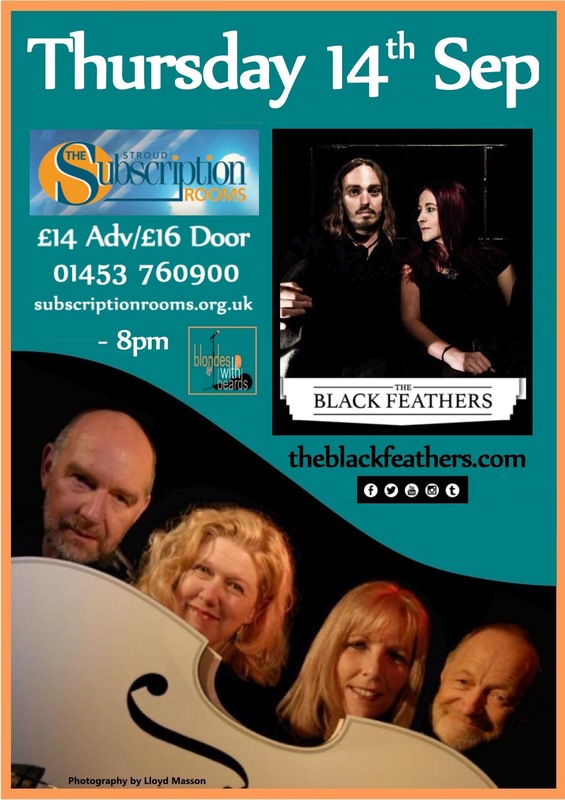 Last night, they supported The Black Feathers who are also Gloucestershire based at Stroud Subscription Rooms. Blondes with Beards music is a range of Folk, Country and Blues and they play a mix of cover songs and original material. I had never heard of this group before which made me realise that I really should start getting to know the local scene a bit more. Not knowing what to expect, I was pleasantly surprised. The group consist of two females (The Blondes – Jo and Jan) and the two males ( The Beards – Richard and Paul). The two ladies do most of the singing with Jo I believe playing a range of quirky instruments that I could not name you. Jo and Jan both have exceptional voices which are very rich and harmonious, blending beautifully together and showcasing some true talent. For some reason, they reminded me of Christmas, I just wanted to sit down with some mulled wine and listen to their voices all evening. Paul was on the bass throughout the evening with Richard on the guitar as well as additional vocals. Richard also has a fantastic voice very suited to blues and folk. Blondes with Beards are entertainers to say the least and they had the audiences attention throughout their performance – they certainly kept me highly entertained during their entire set. Richard, the talker of the group was full of interesting facts and stories which were mostly comedic and he had the audience laughing on several occasions. The group, a mature four piece and very like able sang a range of covers from Roy Orbison, Norah Jones, Mary Chapin Carpenter and others that I did not note. It was hard for me to know for sure which songs were their own material but that can only be a good thing as each song played was delightfully enjoyable, well sung and well played instrumentally. One of the highlights for me was their song about the small town that we all live in (Stroud). Stroud is a very organic and quirky town and as they rightly stated, full of every type of theraputic treatment that you could think of. The lyrics to this song were hilarious, very tongue and cheek and describing Stroud so perfectly and seeing as the majority if not all of the audience were local, this song was very relatable. Whether you are local to Gloucestershire or not and just want to be entertained of an evening then I highly recommend going to see Blondes with Beards as you will have a pleasant evening with good music, laughs and wonderful company. News: Holloway Road’s new single ‘Under Cover’ – out Sept 22nd!